Our Mission is to encourage a healthy lifestyle by providing information that will enable people to make better choices in managing their health. We show that health is a gift, and that by following nature's health laws, people can indeed take charge of their health and enjoy their life more abundantly. ...providing life changing information to the thinking mind. Contact us to book a health seminar in your area. We at Amazing Health believe that wellness is not just physical but also mental, emotional, and spiritual. For that reason, we have changed our logo to better represent these principles. The Amazing Health logo was designed to clearly depict the essence of health, which is founded in eight health laws. 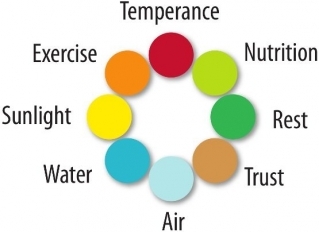 Its pure iconography refers to a simple flower or wreath formation; its eight cheerfully-colored petals each representing a corresponding theme: light blue for air, aqua blue for water, bright yellow for sunlight, energetic orange for exercise, fresh green for nutrition, deep green for rest, roadblock red for temperance and calming beige for trust in God. When combined together, these eight laws complement each other in a perfect, yet simple shape. You can easily see it echoes many of God's perfect designs, such as a flower, a snowflake, or a star.